Hot Rodding may have begun in southern California, but the guys at Big Oak Garage in Hokes Bluff, Alabama have certainly perfected the craft. They have given the “Big Oak” treatment to this 1965 Dodge Dart, which I saw on display at the 2015 SEMA Show in Las Vegas. The car’s bright green and chrome look caught my attention right away! The color is actually a stock Mopar color called “Green With Envy,” which I thought was very cool. You don’t see too many of these cars around, especially at a show like SEMA which is dominated by pro-touring Camaro and Mustang builds. The Dart stands out, and in a good way. 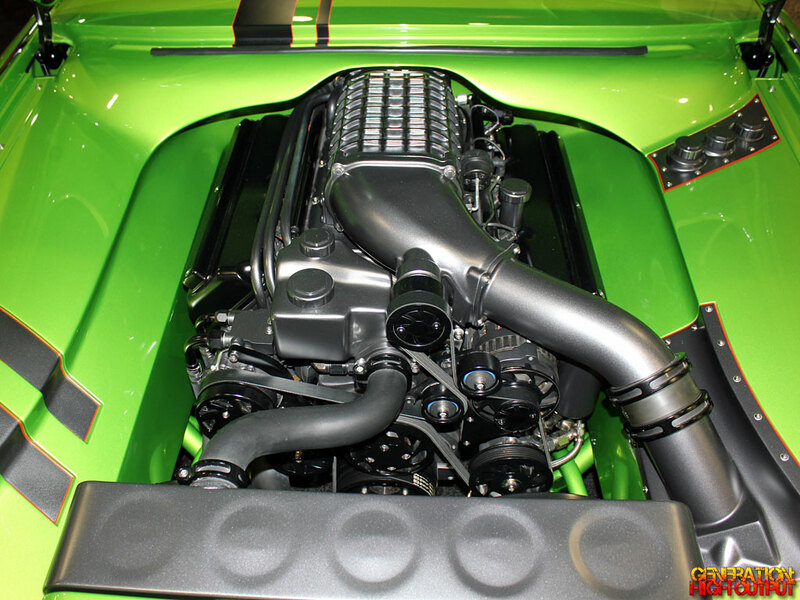 The heart of the beast is a Gen2 HEMI V8 that was originally a 350cid motor and was then bored and stroked to a 392. A Magnuson supercharger provides a real kick, and the whole thing is hooked up to a Tremec 6-speed manual gearbox. The interior is all custom, from the dashboard to the one-off Classic Instruments gauges. It looks like a modern car inside! The big thing with this car is the body work. There was a tremendous amount of cutting, welding, poking, and prodding at the sheet metal of this car to make it look the way it does. The front and rear bumpers and panels are all hand-fabricated. There are over 110 body modifications and 42 one-off machined components on this car! It was voted a Great 8 Finalist for the Ridler award at the 2015 Detroit Autorama, which is a tremendous nomination! What an honor for the guys at Big Oak Garage! We hope to see more of their work at SEMA and other shows in the future. This entry was posted in SEMA and tagged Alabama, Big Oak Garage, Dart, Dodge, engine swap, Great 8, pro touring, Restomod, SEMA, SEMA 2015 by Trevor Freeman. Bookmark the permalink.